Day 59. Some of these creative tools require time and experimentation to figure out what you can do with them. I made a 3D model a few weeks ago using a very cool iPad app called 123D Creature from AutoDesk. It's amazing software, and really shows just how powerful the graphics hardware is on the latest iPads. I wanted to push this idea a bit further, so this creature is a little more sophisticated than the last one, with a more complex skeleton and more detailed modelling, lighting and rendering. Once I made the model I snapped shots of it in different positions (just to show that it really is made in 3D!) I then dropped those images into Diptic and arranged them into this grid design. One thing this daily create project is really forcing me to do is "app smashing", where content is passed from app to app to come up with interesting things that the combination of those apps can offer. Day 58. 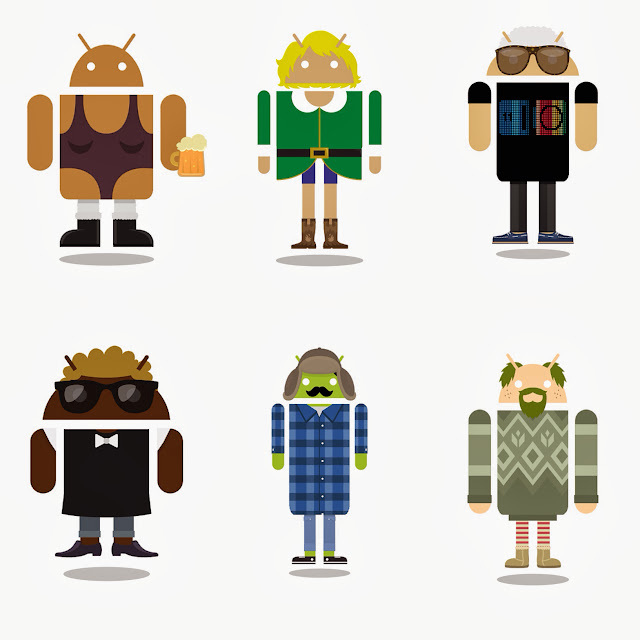 Today I used an Android app called Androidify to create these cute little Android variants. 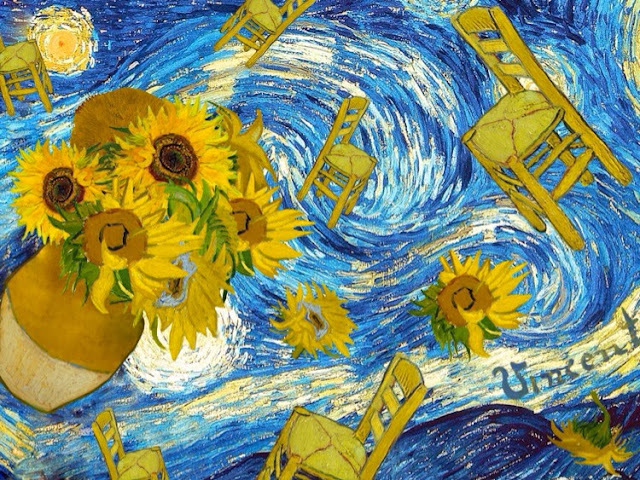 I actually used the randomize function in that app, (and a small amount of aesthetic intervention) to make these little fellows, then saved them to the gallery before importing them into Diptic. I know this is similar to the robots I made the other day, but I wanted to make something similar on Android instead of iOS. Day 57. I was messing about with my mum's iPad tonight and showing her how the Funny Movie Maker app works. In the process I made this very silly video. FYI, I like Ben Franklin, but his was one of the few faces that comes in the free version of the app so he got to be the victim of my stillness. Sorry Ben! Day 56. 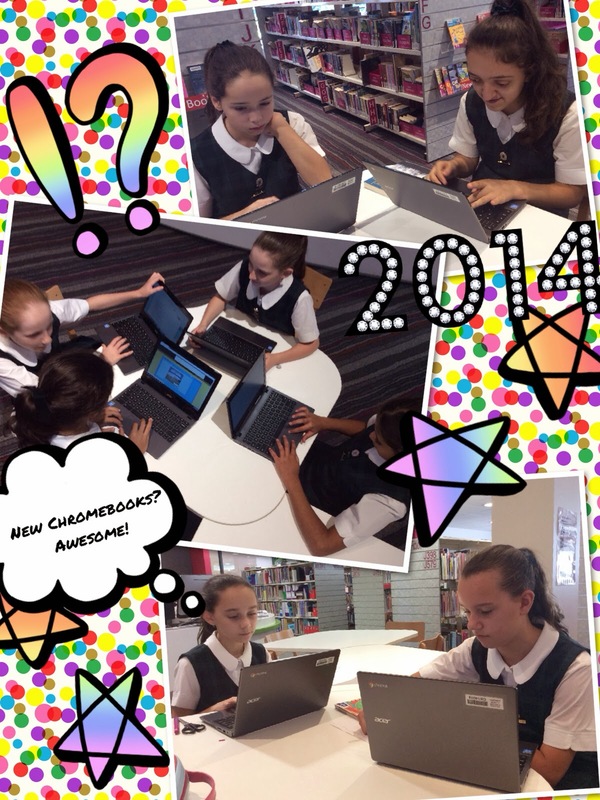 Our school is launching a BYOD iPad program for our Year 5 and 6 kids this year. Tonight we held a parent information evening where I was asked to speak to the parents about the reasons, rationale and strategy for its implementation. We thought it would be a good idea to record the session for any parents unable to attend, so I decided to make it my daily create for today. The slides were created in Apple Keynote for OSX, then exported to a PDF file and imported into SlideShare.com. The audio was made with a Rode lapel mic plugged into my Nexus 4 phone, and recorded with an Android app called Easy Voice Recorder. The audio file was then transferred from my Nexus 4 to my Mac using a wireless file transfer app called AirDroid, edited in Audacity, then uploaded to SlideShare and synced to the slides with their slidecasting feature. Sadly, slidecasting in SlideShare is about to be discontinued on Feb 28. I don't know of another service that does this syncing of slides and audio, and I have used the feature quite a bit in the past so I'm disappointed to see it go. Day 55. 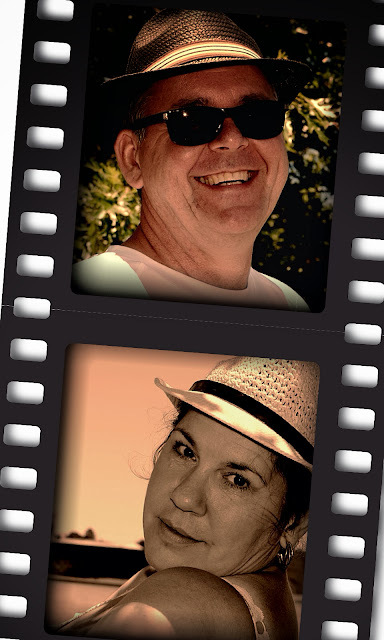 Using an iPad app called Strip Design, I imported a couple of photos of Linda and I and applied a few filters to spruce them up (or down, depending on your point of view) and then arranged them in this film frame. Lots more you can do with this app, so I'm sure I'll play with it further. I am enjoying the way this daily create is pushing me to explore more apps than I ever used to and to see what they are capable of producing. Certainly as we go BYO iPads this year at school I think it's been really valuable to spend more time playing with mine. Day 54. I found this cute little app called Abby Robots. It's kind of basic but it lets you create your own robots by mixing and matching the head, body, legs and background. 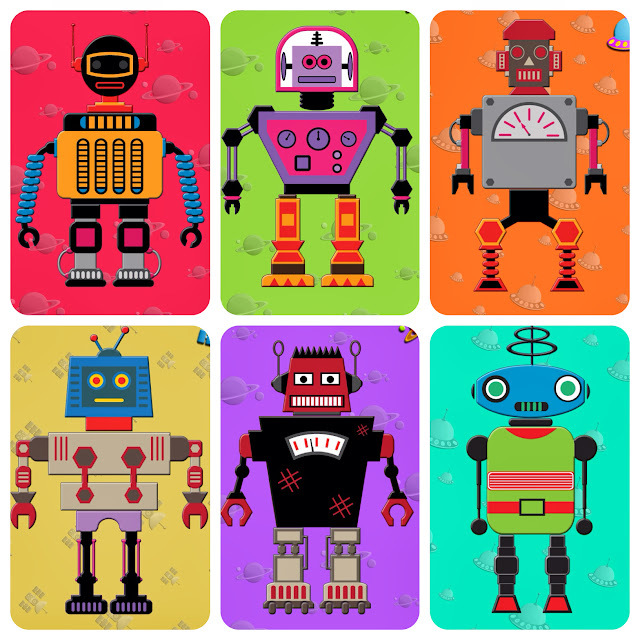 Once I made a few robot variants I used Diptic to put them all in a frame together. Danger Will Robinson, Danger! Day 53. 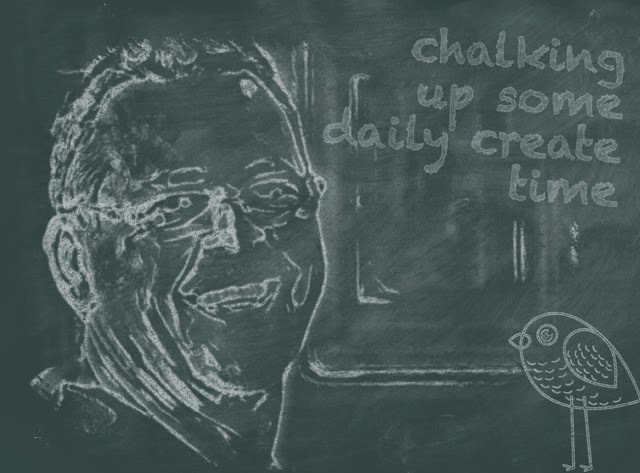 Today I played with an app called Chalk HD. It lets you take photos and text and renders them to look like a chalk drawing on a blackboard. And we all know that blackboards are what every teacher uses right? It's a pretty basic app that really only does this one thing, although it has lots of filters for different effects. If you want to make your photos look like chalk drawings, you've come to the right app. Day 52. I took these couple of photos today at school during lunchtime. We just took delivery of a batch of new Google Chromebooks and the kids were trying them out. I dropped the photos into an app called Pic Collage and tarted them up a bit with some colour and graphics, and this was the result. It's quick and easy to use, although the layering can get a bit tricky. Day 51. I found this quote by James Ogilvy and liked it, so I used Adobe Photoshop Touch for iPad to make this coloured background, then imported it into Keynote for iOS, added a text layer with the quote, then while in play mode in Keynote, took a snapshot of the screen (since there is no JPEG export from Keynote). Then I used the image as the background in the Tellagami app, created a character, then used the speech synthesiser to speak the quote. I believe they call it "app smashing" when you go from app to app like that. In case you're interested, here is the actual quote... "Too much of our work amounts to the drudgery of arranging means toward ends, mechanically placing the right foot in front of the left and the left in front of the right, moving down narrow corridors toward narrow goals. Play widens the halls. Work will always be with us, and many works are worthy. But the worthiest works of all often reflect an artful creativity that looks more like play than work." That's something I'm really finding with this daily create project... Creativity looks far more like play than work. Day 50. In June this year I will be helping facilitate at the Flat Connections Conference in Sydney with my fellow Aussie global educator Julie Lindsay. Julie suggested that those of us who are facilitating at the event might contribute a short video snippet introducing themselves and the event, and then asked if I would put them together into a single video. So after a few days of messing about in FinalCut Pro X, here is the finished product, presented as my daily create for today. It'd be great to see some of you at the Flat Connections Conference in June... I'm sure it'll be an amazing few days! Day 49. I was completely devoid of an idea for today's daily create, and I crawled into bed without having made something for the day. As I lamented my lack of creativity, Linda started making some suggestions... Most of which I was probably too dismissive of. "Creativity is finding good solutions", Linda said. Still, little inspiration seemed to float around my head. "What about a song? A cartoon? Or a superhero?" But my creative processes were turning up a zero. "Maybe you could make a web account for something new? There's always new things on the web to see and try and do!" So I sat and pondered further, feeling somewhat brain depletive. And pretty soon, hey how 'bout that! I wrote a daily poem! Day 48. 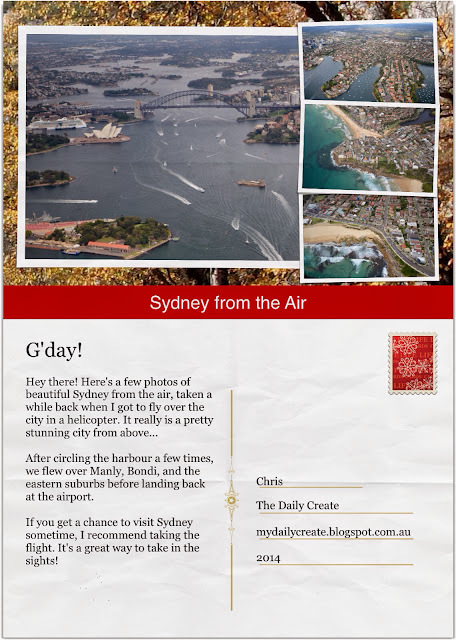 A couple of months ago I had the opportunity to fly over the city of Sydney in a Robinson R22 helicopter, and took a bunch of photos. So in today's daily create I used some of those photos in an app called LifeCards to generate this digital postcard. Day 47. 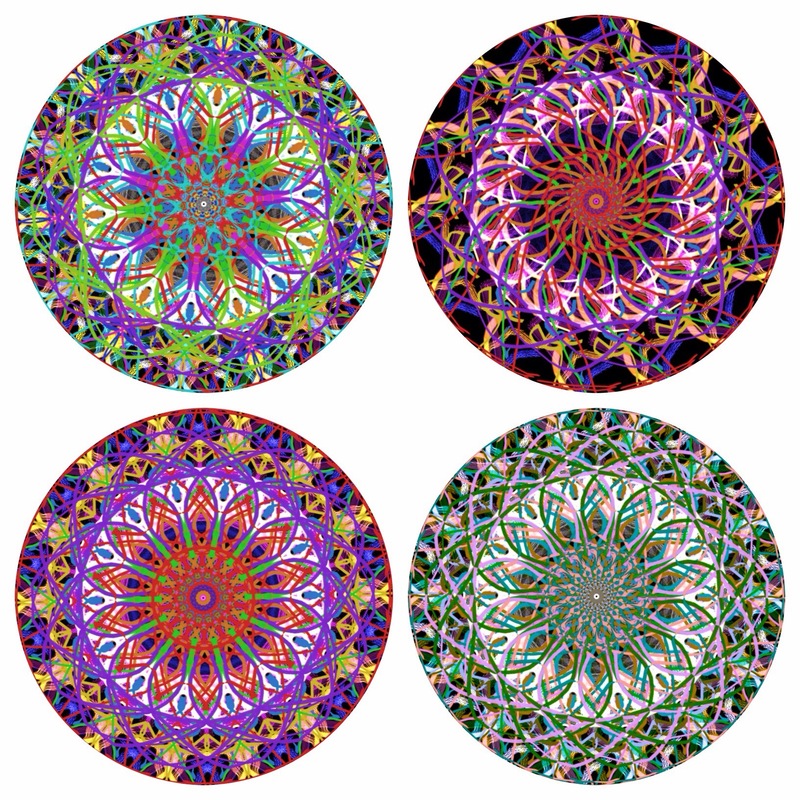 These pretty mandala designs were made with an iPad app called iOrnament. It lets you create symmetrical patterns with amazing sophistication, especially if you splurge out for the 99c in-app purchase to unlock the extra features. I created one basic round mandala design then applied some randomising effects to it, to create the four variations you see here. All four of these design variations are based the same basic pattern. Once I made all four of them I arranged them in this 4-up grid design using another app called Diptic, which can arrange multiple images in a single framed picture. Day 46. 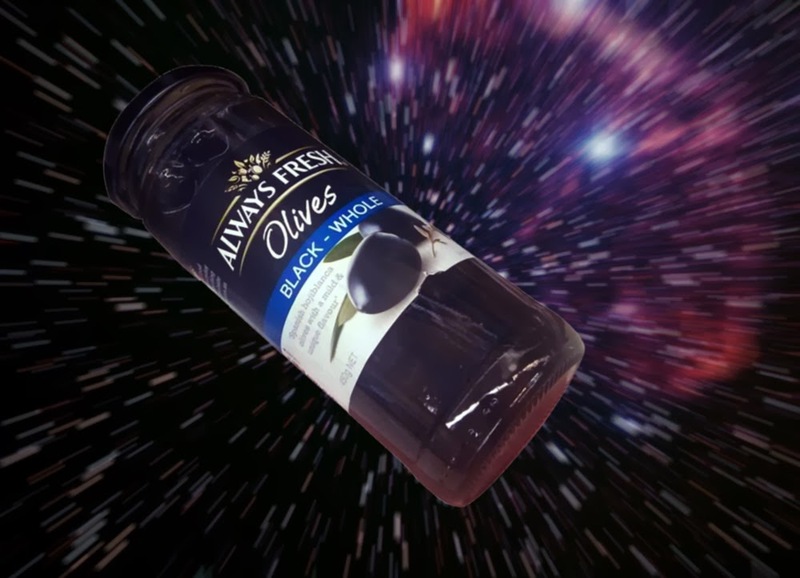 At the supermarket today I spotted this jar of whole black olives and was struck by the idea of the obvious visual pun. So a quick photo in the store with my Nexus, a search through Flickr to find this Creative Commons background image of the Crescent Nebula by Paul Hutchinson, and some fiddling around in Adobe Photoshop, and I ended up with this image... conclusive proof that there are black (w)holes in space. Of course, I mean that in a relatively general sense. Day 45. Valentines Day today and my daily create was that I made dinner for Linda and I. 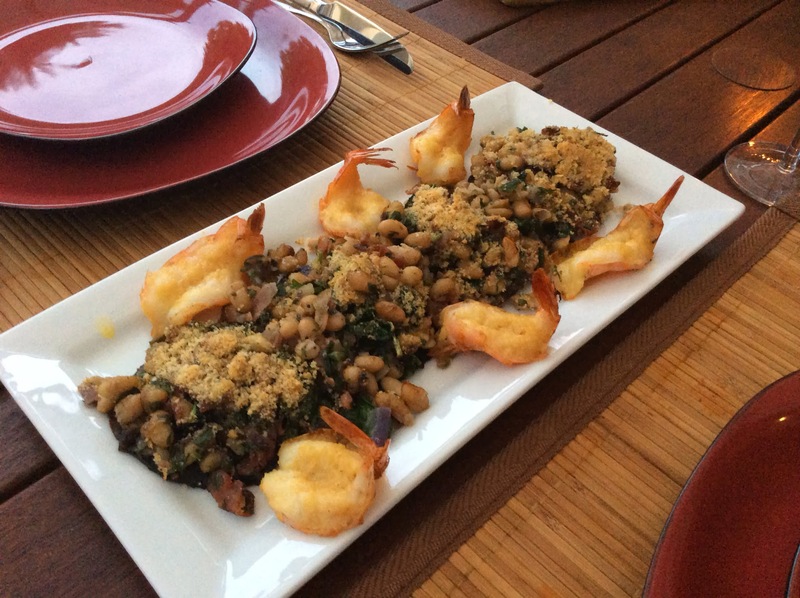 We had an appetiser of baked mushrooms stuffed with white beans, coriander and onions. 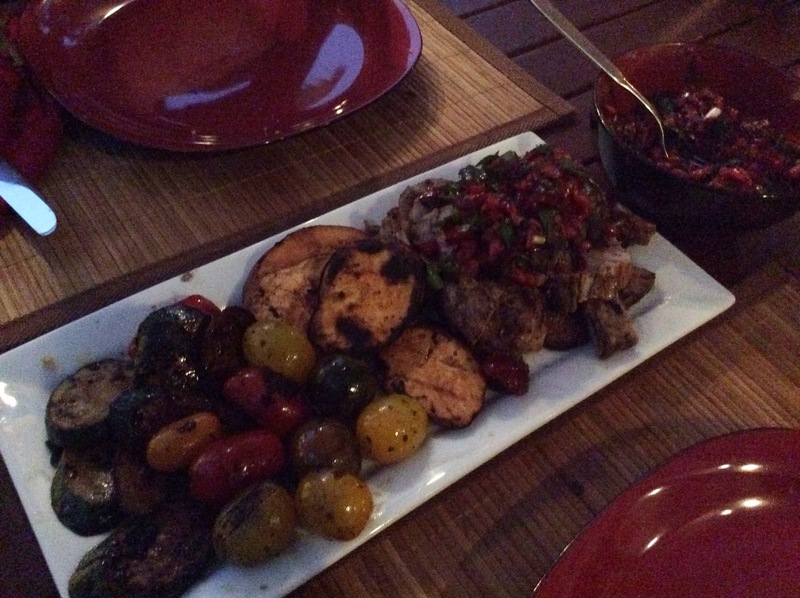 Followed by a main of BBQed pork tenderloin and cherry salsa. Never made these before, but they were pretty good. Day 44. Out with some friends at the King Street Brewhouse at Darling Harbour. Drinks, snacks and plotting to change the world. 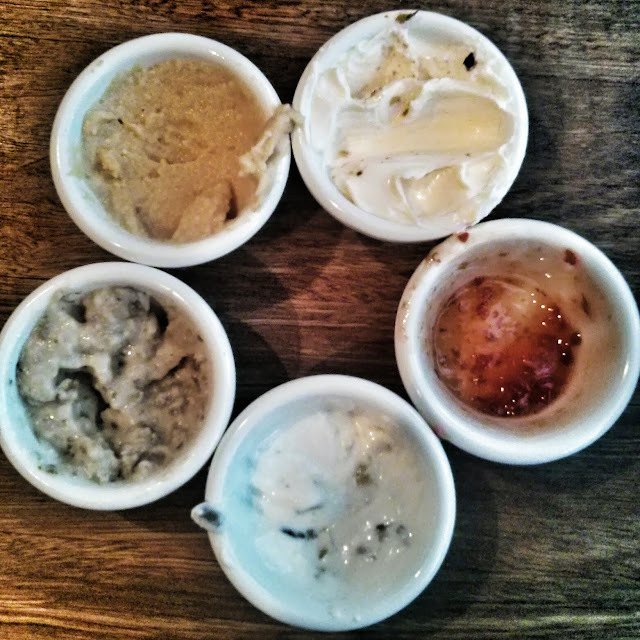 Enjoyed the dips. Here's the evidence. Yum. By the way, the creative part was not eating the dips (although I believe that did take a certain amount of style and panache) but in deciding to arrange them in this pentagon design, photograph them with my Nexus 4, then crop and edit the image with Snapseed for Android. Day 43. For this self portrait I used a photo taken by my buddy Allan Psaila and imported it into an iPad app called Warhol DIY. 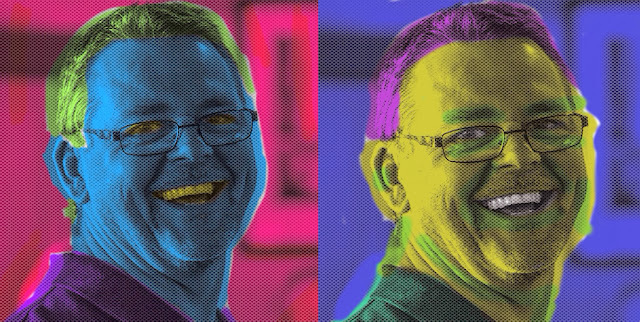 This app applies the same kind of artistic techniques that Andy Warhol used in his famous 50s Pop Art work; silk screening using photo dot screening, flat colours for underpainting, and colours deliberately out of registration, etc. I made two different versions, then imported them into Adobe Photoshop Touch and placed them side by side and cropped them into one image. Day 42. After 42 days of making a daily creative thing each day, I finally forgot last night and went to bed without making one. Oops. So I'm making up for it this morning with this drawing made using the app called Paper by 53. It's a beautifully designed app! This is a sketch I just made with my right hand, of my left hand with a piece of string tied to a finger to help me not forget again. I really like the "papery" nature of Paper, and considering you're drawing on an iPad screen the pencil tool does look remarkably like a real pencil. I used a Jot Pro stylus to draw with, which certainly helps a lot. Day 41. After playing with Autodesk's 123D Catch the other day I discovered that Autodesk actually make quite a few different (and amazing!) 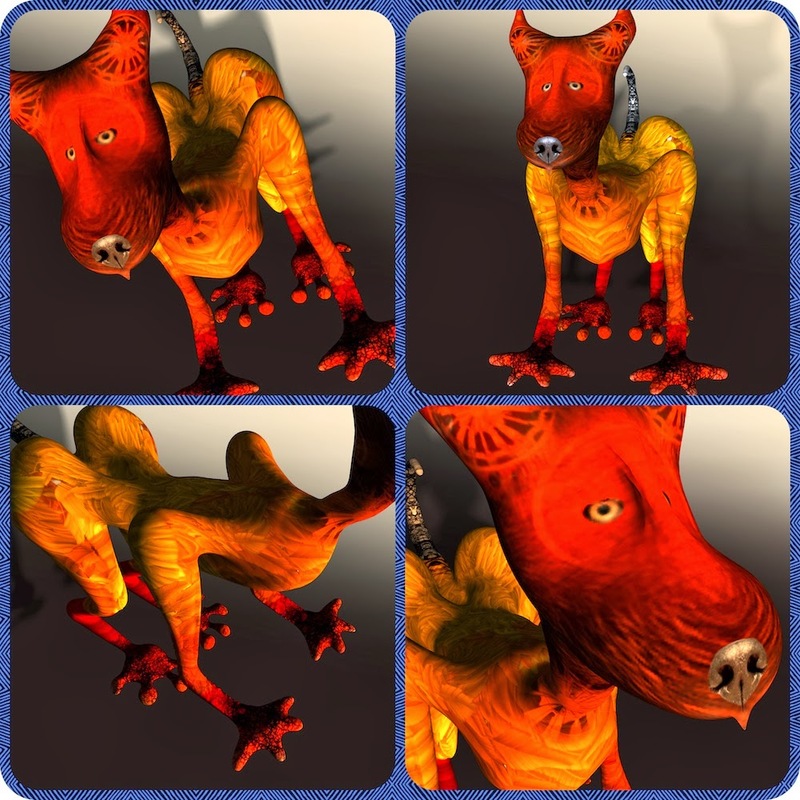 virtual 3D modelling tools for the iPad. 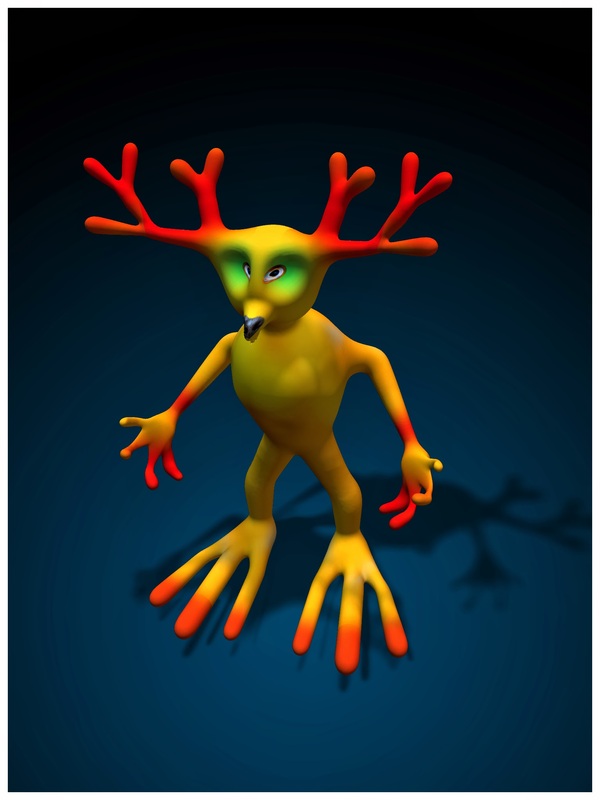 Today's create is my first attempt at using 123D Creatures, an incredible 3Dmodelling tool for making imaginary creatures. On the iPad it's actually a full 3D model that can be fairly easily sculpted and modelled in 3D space. Very cool. Day 40. The final day of the Sydney Chinese New Year celebrations finished with the Dragon Boat Festival at Darling Harbour. This is the second year I've been part of a dragon boat team, paddling with the HKETO team. This video was shot during our third heat, which we won, from a camera strapped to the head of our drummer Arthur. I didn't really edit the footage much as I just wanted to share the actual race from start to finish as seen fro inside the boat. It was shot on a GoPro Hero3 and edited with Adobe Premiere Pro and compressed to 720HD using Adobe Media Encoder. We ended up coming second overall in one division and third in the other division. Day 39. I was given a bunch of flowers yesterday, so I used an iPad app from Autodesk called 123Dcatch to turn them into a 3D model. By taking 20-30 images from all angles, the app will stitch the model of the object together in 3D space. This first attempt is not perfect by a long stretch, but I'll play some more and see what I can come up with. Certainly is an interesting idea though! 3D printer anyone? 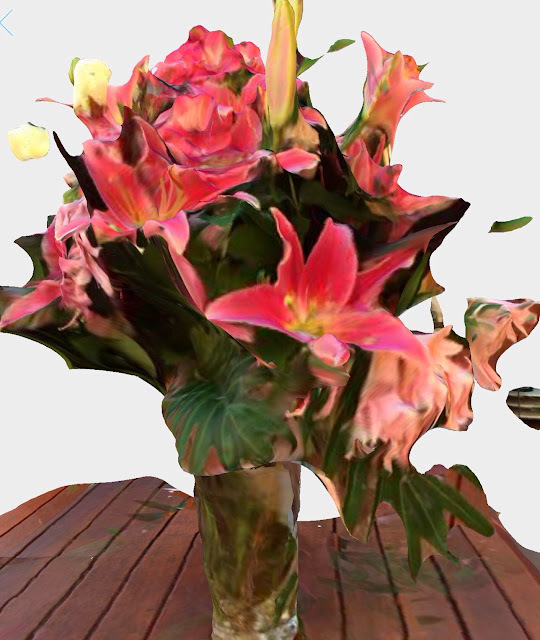 If you go to this address, http://www.123dapp.com/obj-Catch/Bunch-of-flowers/2106817, you can download that actual 3D model and play with it, see some of the original photos that generated it, and even have a go at making one yourself. Day 38. 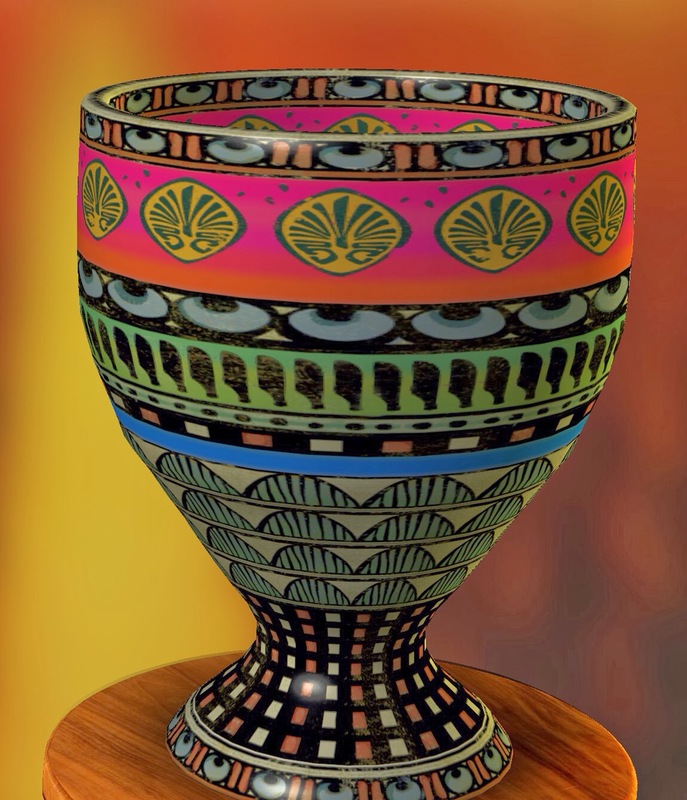 Today's create is a piece of virtual pottery created in an iPad app called Pottery HD. It lets you create virtual pottery on a virtual wheel and decorate it with virtual glaze. You need to earn points to have access to better brushes and colours, and it gradually gives you more tools as you use it. It's surprisingly engaging. This pot was made on a (virtual) wheel using (virtual) white clay and decorated with (virtual) Egyptian brush designs. Despite what you might imagine, if you keep playing this app you end up pushing your design ideas further and further in an attempt to keep coming up with different pot designs. Day 37. A good quote has the ability to distill a complex idea down to a sentence or two. You can quote me on that. 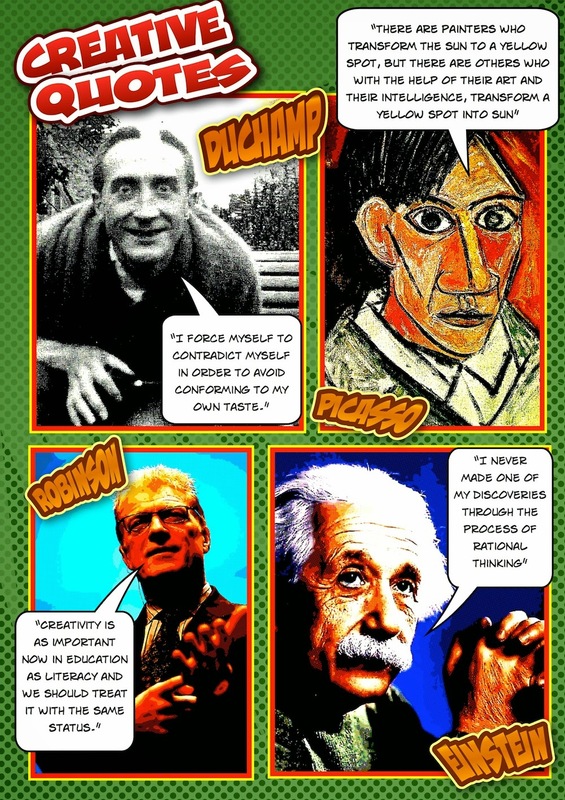 For today's creative task I made this poster of quotes about creativity using Comic Life. Although I've dabbled with Comic Life before, and had my students using it for their work, I should probably make more use of it... it's a very cool piece of software. PS: You can click the image to enlarge it. Day 36. 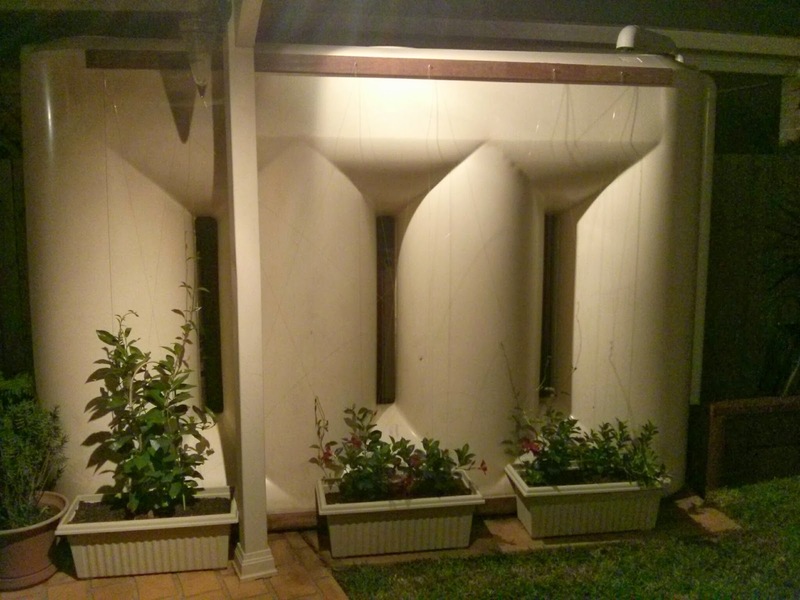 My mum gave us a climbing plant for Christmas and we thought it would be nice to get it to grow over the large watertank in our backyard, which we have always thought was a bit of an eyesore. In fact weliked the idea so much we went out and bought a couple more plants (Mandevillas if you're curious) and some planter pots to put them in. The problem was getting a trellis for the plants to grow on. I didn't want to have to construct anything with lattice... too much work! I thought that a wire mesh would do the trick, but would look pretty ugly, and the plastic meshes were even uglier. Plus, all these ideas for trellis would have been fairly expensive to buy the materials to make them. My creative solution was to buy two Merbau hardwood planks, and I glued them along the top and bottom of the watertank using Liquid Nails. I pre-drilled holes in them and inserted small eyelet hooks, and then threaded heavy duty fishing line through them, up and down and diagonally, until there was a "web" of clear lines for the plants to grow on. In just a couple of days the plants are already sending tendrils out along the lines and starting to grow up the tank. I expect that by next summer it will be pretty well covered. Not only do we have now a trellis that is near invisible and unobtrusive as the plants grow on it, but it cost a total of about $20, and took less than an hour to make. I like being able to come up with one-off creative solutions to household problems like this. Day 35. This image was made using an app called Play Art. It has a collection of arty bits from well known artists that can be dragged around and rearranged. It's good for getting students to look at the different styles and signature artworks of artists, and to play around with compositional ideas. Thanks again to Cathy Hunt from iPad Artroom for putting me onto this app. Day 34. For today's daily create I thought I'd try dabbling in a piece of software that I don't use very much, so I fired up Adobe Illustrator. While I know Photoshop pretty well I've never really felt like I've got to grips with Illustrator. I just started playing around in it and worked out that I could draw a vector shape and then revolve it around its edge to turn it into a 3D object. 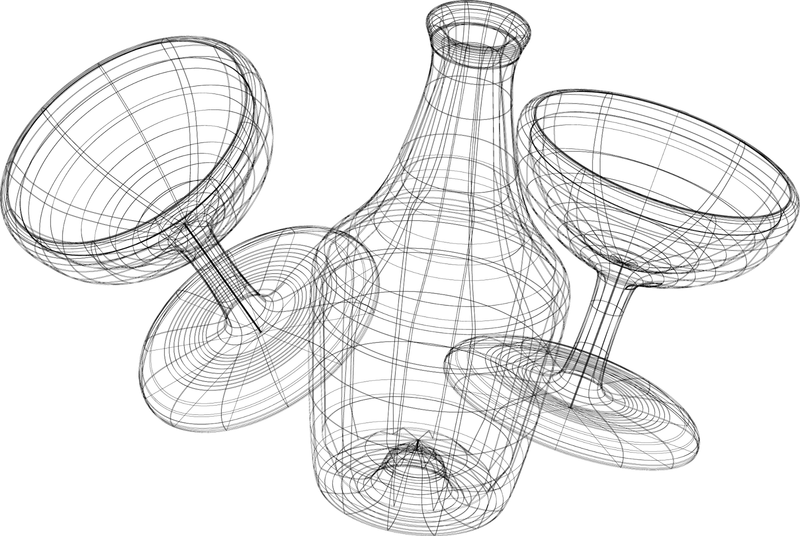 So I drew a half profile of a wine glass, then rotated it to make a 3D wineglass. I tidied up the 2D profile a bit using the bezier tools to give it a nicer shape, and the final 3D object looked pretty good. Then I tried to make a bottle shape the same way. Finally, I duplicated the original glass profile to make the second glass, and here you see the result. I originally rendered them as solid shapes but as I played with the different angles I found I could render them as wireframe objects. Not only did I quite like the look of the wireframe renders, but I also liked the play on words "wire" and "wine", so went with that idea. The bottom line is that while Illustrator is a incredibly powerful piece of software for graphics professionals, it has a pretty steep learning curve. But even just messing around in it you can come uop with some interesting ideas. I like using it but I need to play around in it more to get to a point where I feel I'm controlling it and not the other way around. Day 33. Tonight we went into the city to see the Chinese New Year parade. We met friends in George Street, at what we thought would be a great viewing location for the parade. Turns out it wasn't that great after all. I took my good camera, the Nikon D7000 to take photos of the parade but it was pretty hard to get a good shot. 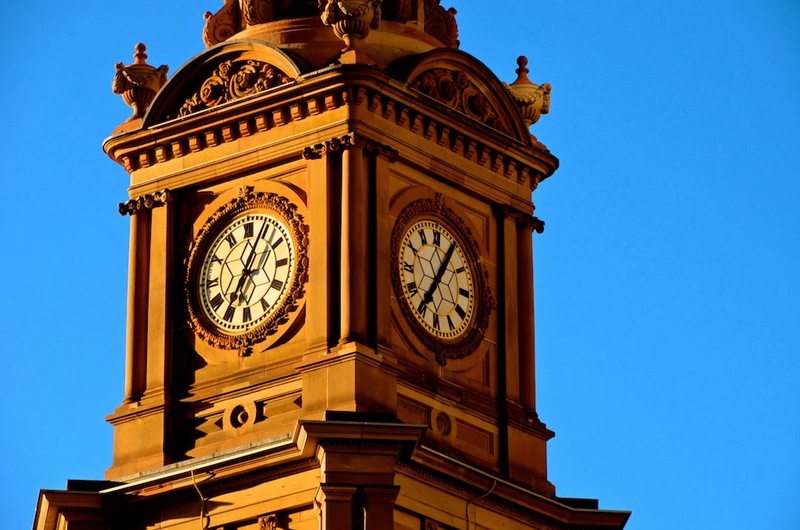 I looked upwards and saw the setting sun hitting the Town Hall clock and snapped a few frames. I particularly liked this one. The contrast of the orange sunlight on the sandstone against the blue sky makes it really stand out nicely I thought, however I did give it a little bit of postprocessing in Aperture just to make it pop. Day 32. After a successful iPad trial last year our school is making more use of iPads this year. We have BYOD iPads in Years 5 and 6, more shared iPad use in Years K-4, and in general a lot of interest from our teachers in making use of them. Because our teachers always seem to have such busy schedules it can be difficult to find times to provide them with PD, especially those extended blocks of time that really allow you to immerse and play and get comfortable with these tools. When you're stressed and pushed for time during the school day, it's often hard to find real space for PD and to enjoy the learning that goes with it. 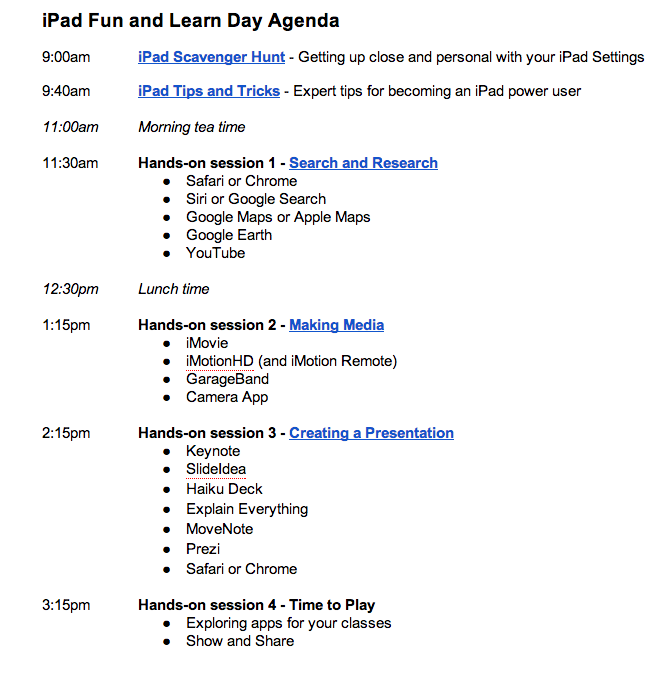 So we tried running a full day Saturday iPad workshop, and surprisingly, about 25 teachers turned up (some even brought their kids and spouses!) And all seemed to have a genuinely good day of it! My goal for the day was to provide them with a fun day of playing and learning, so I gave them some tasks that were the sorts of things they might ask their kids to do. In other words, to (re)experience what it's like to be the learner. The active, engaged learner. Anyway, I spent the last couple of days working on some notes and activities and ideas for the day, so I'm sharing them here as my daily create for today. You can access these notes as Google Docs here. Click through on the links to get the actual projects. Feel free to take, use, modify or re-use them.